Forrester reports that 40% of CMOs say increasing their tech savvy is their top 2012 goal. 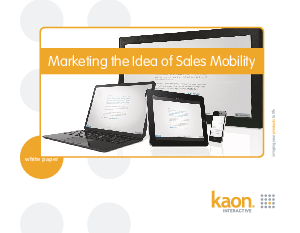 Driving the trend: sales mobility. As complex product companies look to build sales opportunities they're using mobile platforms (iPads and Smartphones) to demo products anywhere, anytime. But the question is, who's developing the dynamic content that's exciting prospects and accelerating sales? Personalize experiences to put the customer in the "driver's seat"